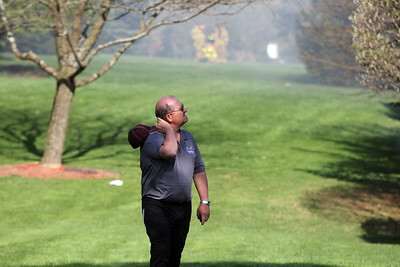 Sarah Nader -snader@shawmedia.com Rick Noe of Crystal Lake watches as put out a fire at his house Wednesday, May 1, 2013 in a Crystal Lake subdivision. 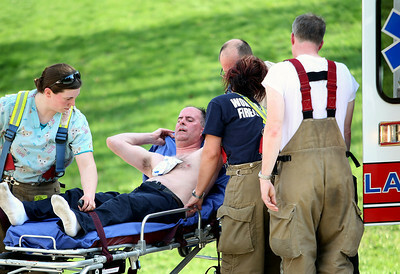 Sarah Nader - snader@shawmedia.com Two firefighters are being treated for heat related injuries after four houses caught on fire Wednesday, May 1, 2013 in a Crystal Lake subdivision. 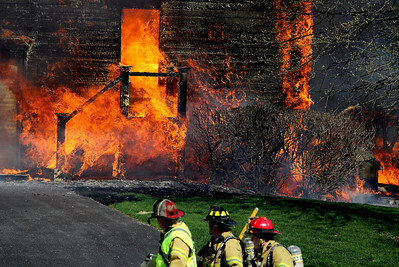 One house is still on fire on the 3200 block of Carrington Drive in Crystal Lake. Firefighters are proceeding with caution because of a ruptured gas line. Sarah Nader -snader@shawmedia.com Two firefighters are being treated for injuries after four houses caught on fire Wednesday, May 1, 2013 in a Crystal Lake subdivision. 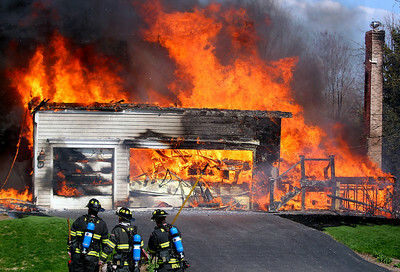 One house is still on fire on the 3200 block of Carrington Drive in Crystal Lake. Firefighters are proceeding with caution because of a ruptured gas line. 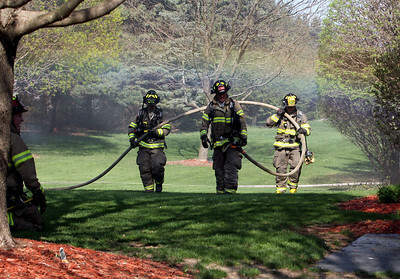 Sarah Nader -snader@shawmedia.com Two firefighters are being treated for heat related injuries after four houses caught on fire Wednesday, May 1, 2013 in a Crystal Lake subdivision. 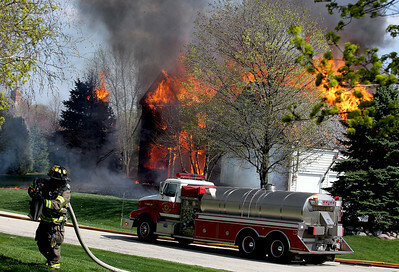 One house is still on fire on the 3200 block of Carrington Drive in Crystal Lake. Firefighters are proceeding with caution because of a ruptured gas line. 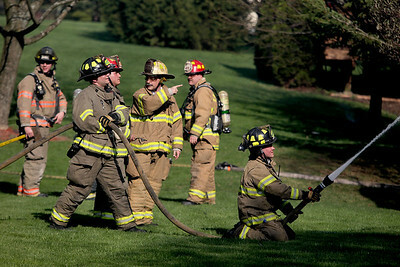 Sarah Nader - snader@shawmedia.com Firefighters watch as a home burns at 3217 Carrington Drive in Crystal Lake on Wednesday, May 1, 2013. 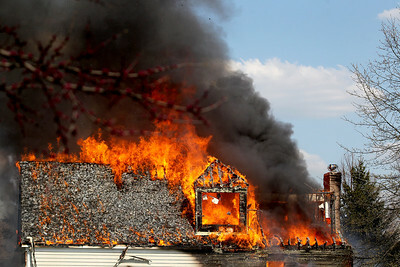 The fire originated sometime after 3:30 p.m. and quickly spread to three other homes. 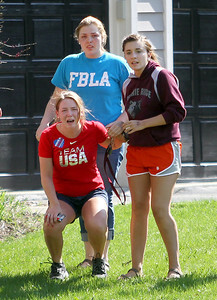 Sarah Nader - snader@shawmedia.com Courtney Lefevre (front) who was reportedly in the house when it caught on fire reacts as she sees her home burn to the ground on Wednesday, May 1, 2013. 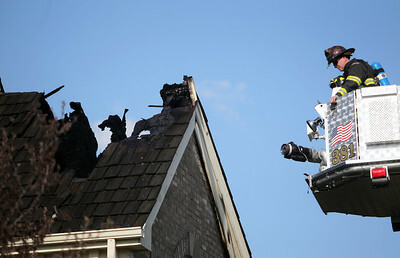 The fire originated sometime after 3:30 p.m. and quickly spread to the other homes. 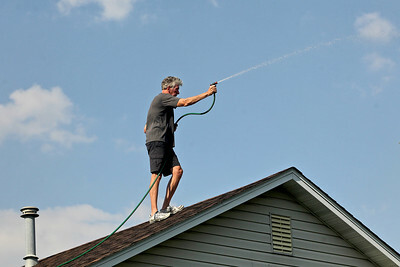 Sarah Nader - snader@shawmedia.com Larry Connolly of Crystal Lake helps a neighbor spray his house with water after four houses near by caught on fire in a Crystal Lake subdivision on Wednesday, May 1, 2013. 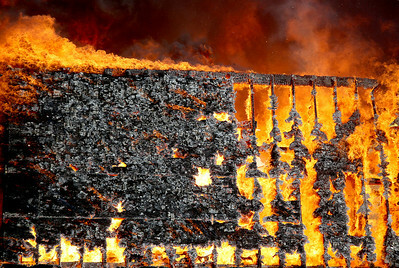 The fire originated sometime after 3:30 p.m. and quickly spread to the other homes. 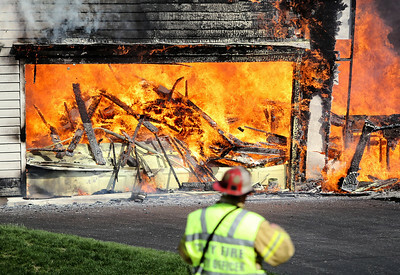 Sarah Nader - snader@shawmedia.com A firefighters inspect a home after four houses caught on fire in a Crystal Lake subdivision on Wednesday, May 1, 2013. 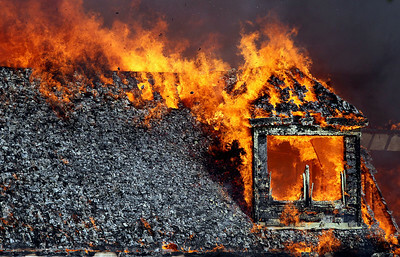 The fire originated sometime after 3:30 p.m. and quickly spread to the other homes. 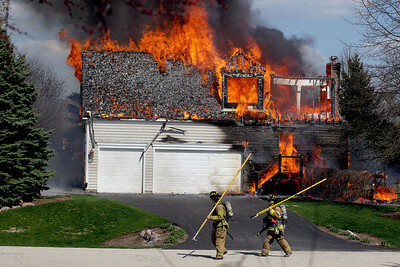 Two firefighters are being treated for injuries after four houses caught on fire Wednesday, May 1, 2013 in a Crystal Lake subdivision. 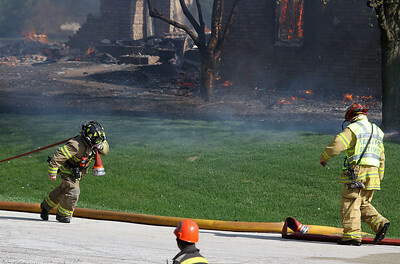 One house is still on fire on the 3200 block of Carrington Drive in Crystal Lake. Firefighters are proceeding with caution because of a ruptured gas line.